Gov. Jerry Brown and attorney Molly Munger aren’t the only ones asking voters for more money for schools in November. Eleven districts are asking for parcel taxes and 44 districts have put school construction bonds on the ballot, according to Mike McMahon, a school consultant and Alameda Unified trustee who tracks local ballots. Six are new parcel tax requests, four are renewals, and one proposal asks for an additional parcel tax, McMahon says. They range from a low of $39 per parcel to $199 per parcel in the San Bruno Park School District. 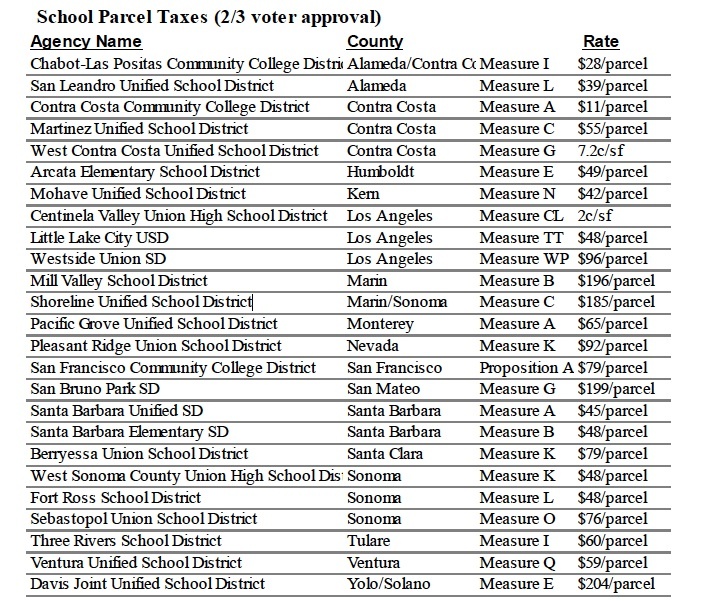 Parcel taxes on the November 2012 ballot. Source: CaliforniaCityFinance.com (click to enlarge). Update: As reader Michael Coleman notes in a comment below, there is a more extensive list of bond measures and parcel taxes. 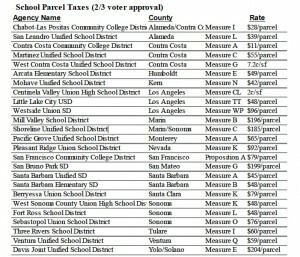 Here is a snapshot of the full list of parcel taxes, at left. Parcel taxes have been common in the Bay Area – not only in wealthy communities, but in less posh places like Martinez Unified, which is asking $50 per parcel, and San Leandro Unified ($39 per parcel). In this round, however, five of the 11 districts are in Central or Southern California: Santa Barbara Unified, Ventura Unified, and three in Los Angeles County – Centinela Valley Union High School District, Lake City School District (near Whittier), and Westside Union School District (in Quartz Hill). Parcel taxes require a two-thirds majority to pass; so far in 2012, 13 of 19 managed to attain that threshold. Construction bonds require only 55 percent majority to pass. In June, 25 of 34 bonds on the ballot passed. The 44 bonds on the November ballot would generate $4 billion for district projects. The biggest would be $449 million requested by San Dieguito Union High School District in Encinitas. Is there somewhere a guide for the procedures for putting a bond on the ballot and then how it all works? Also, note that some local school bond measures do not meet the requirements for 55% voter approval and will require 2/3 approval. Thanks, Michael. There are indeed more on the ballot. The 105 bond measures represent more than 10 percent of districts. And there are two-dozen parcel taxes.